Xplore understands that not all those who wander are lost. 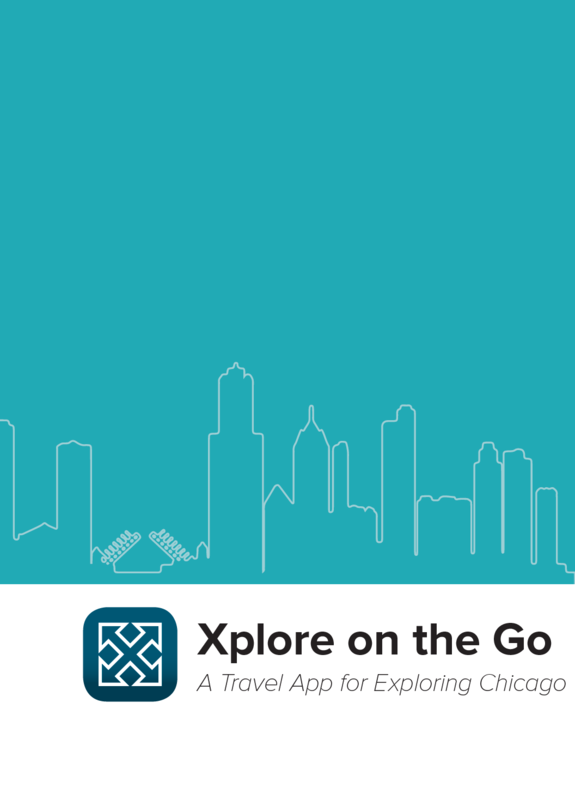 Xplore on the Go provide a way for users to effortlessly experience Chicago through their own lens. This app empowers travelers to cultivate their own personalized experience and avoid the cookie-cutter approach to pre-planned vacations. We alleviate the frustrations of vacation planning and replace it with on-the-go, augmented, and spontaneous travel. 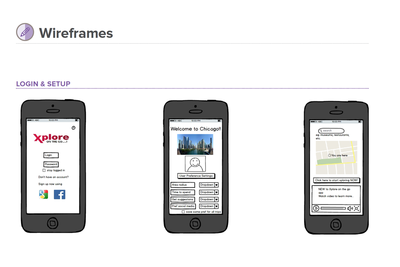 Design a mobile app for exploring the city of Chicago. The app will focus on one aspect of tourism like dining, art, culture, or sightseeing. 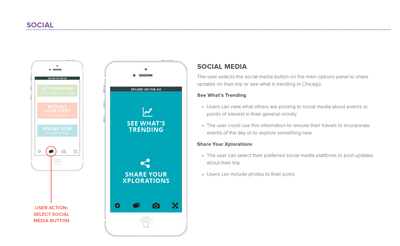 The challenge in designing a sightseeing app is that a plethora of travel resources already exist—tour books, magazines, travel blogs, Yelp, and numerous mobile apps. The goal was to develop an app that would incorporate all the advantages of these resources, but offer a unique travel experience in alignment with the needs of an on-the-go traveler. 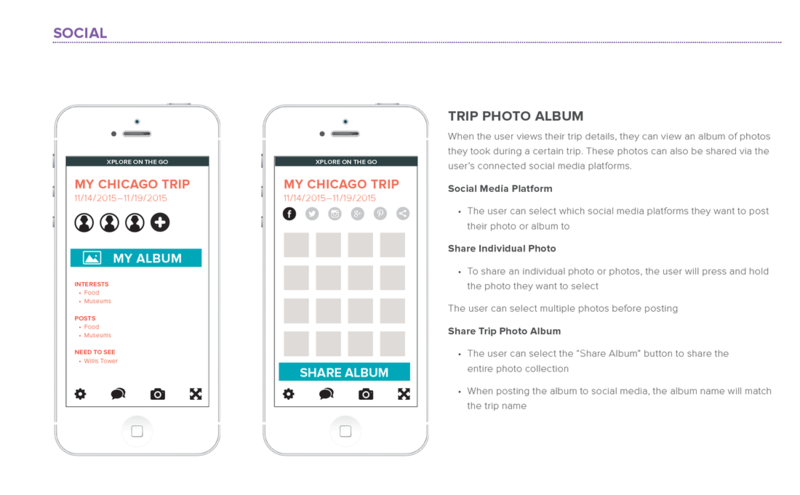 The app would also include features that would help “plan” an unplanned trip as well as allow the user to document and share their experiences. Planning a “perfect” itinerary can be a time-consuming and arduous task, with countless hours spent reaching restaurants, places of interests, and how the local transportation system works. 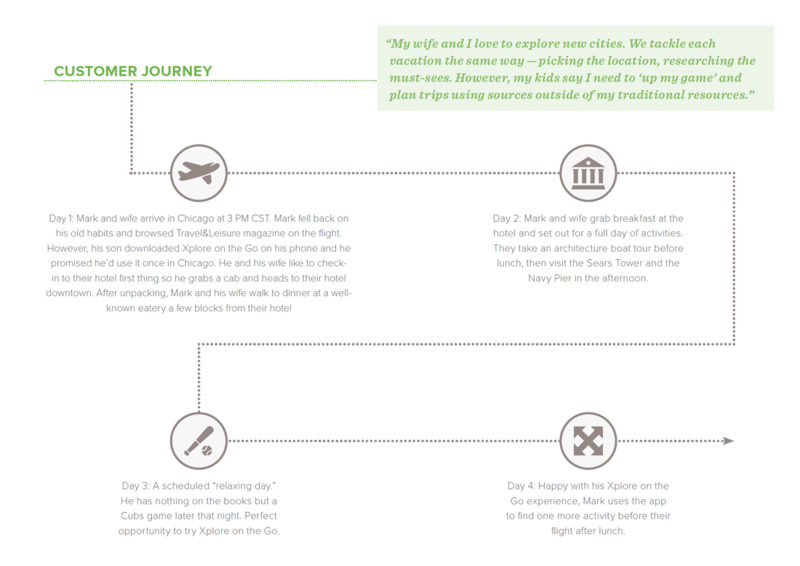 If the traveler is not a planner, the “perfect” itinerary has to happen very serendipitously. Ultimately, this app needed to keep up with the needs of an on-the-go traveler who needs a travel resource as ready to go as they are. With our key audience in mind—the spontaneous and social traveler—our team sought to create an app that would assist in creating an effortless, perfect day in Chicago that, with minimal input from the user, could anticipate the user’s travel wants and needs. I envisioned the user being able to draw from a large database of restaurants, points of interest, events, and daily activities to dynamically plan their experience on demand. The mobile environment presents an ideal platform for a travel solution. The user will not be tied down by travel resources that are antiquated or inflexible with their spontaneous travel style. At the same time, the user will have information at their fingertips on a device they would not leave home without. 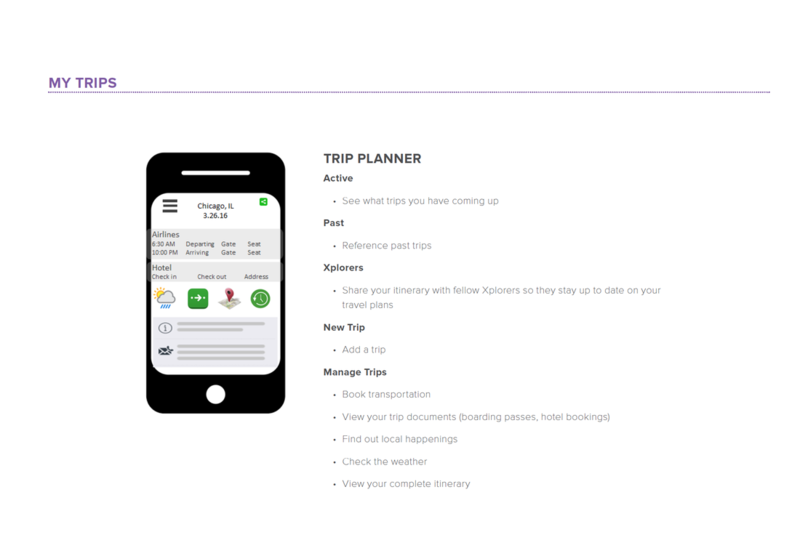 This app needed to have the utility and comprehensiveness of a tour book, the up-to-date information of online sources, and the mobility of on-demand information via the user’s phone. The solution is Xplore on the Go. We selected our research methods by further defining the problem, identifying sources of friction, and broadly segmenting our target users. Moving forward, we decided to focus on asking “why” questions by distributing a survey within our team’s personal networks. 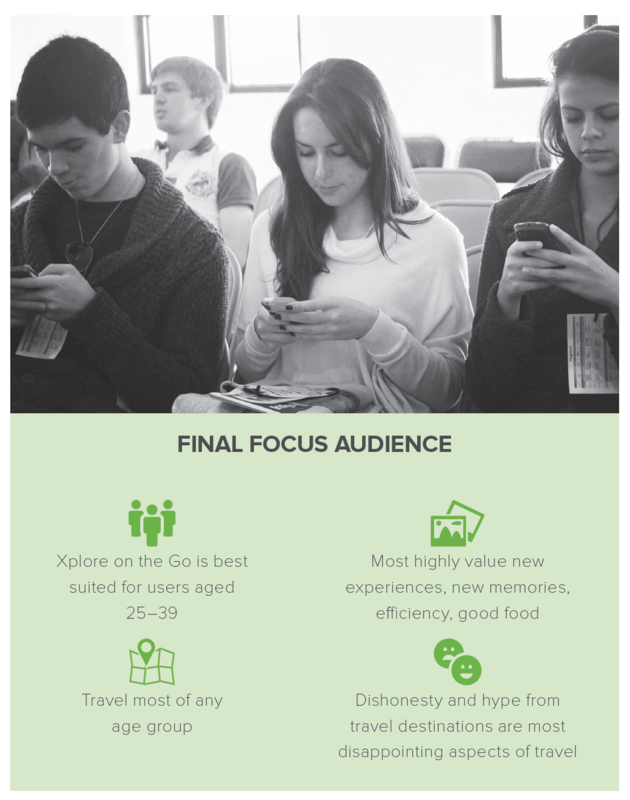 To start this process, we performed a competitive survey to determine resources our audience currently have access to, Xplore on the Go’s competition, features of existing travel aids that we wanted to integrate into the app, and provide a user-friendly and convenient resource. 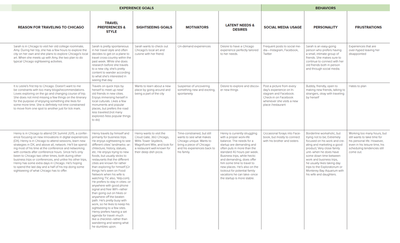 Understand what is important to the audience and how they prioritize their interests. Why is the person traveling? What are they interested in? See how the different members of the audience explore a city, what types of things are most important to them, what are they looking for? What habits do they exhibit? How do they use their mobile devices? What friction points do they come across that they do not even notice? Harness geolocation and accelerometer data to see birds-eye travel patters and habits. When the person explores, what do they bring with them? Do they bring their camera with them? Do they bring a book/Kindle with them? How is the user actually prepared for travel? How much do they pack? 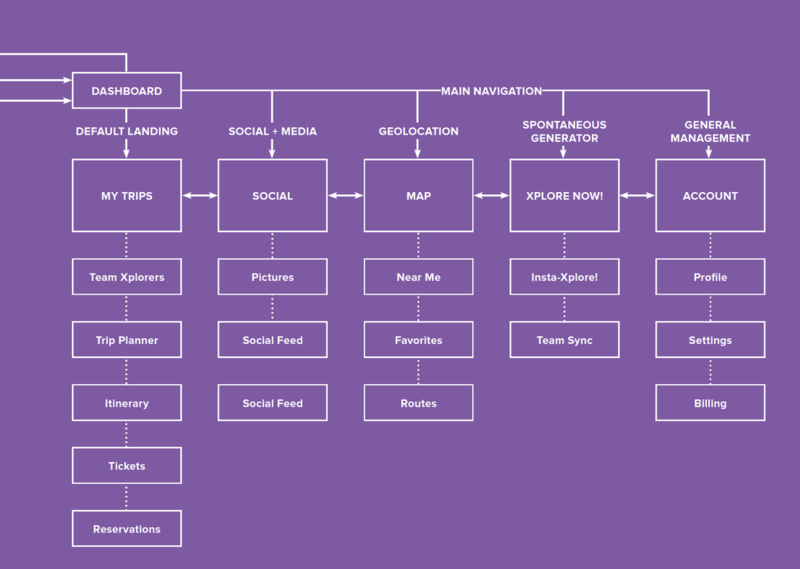 All of these influence the user’s persona and travel habits. Have potential user give us a guided tour of their destination. What do they like to show us? What do they feel is fun to see? We can ask our audience to rank cards by preference and see what values they prioritize. To understand our competition, we surveyed other products on the market, including books, Yelp, Google, and other travel apps. We asked travelers/ travel writers what resources they use. We also explored tools that are already solving problems and learned which problems are still pervasive. 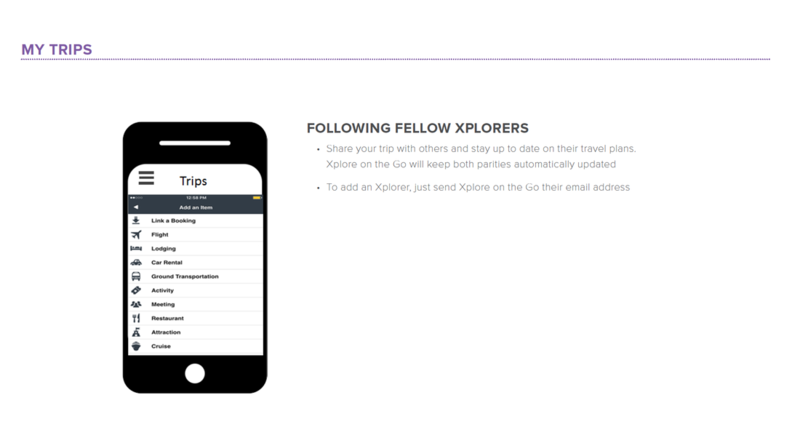 Xplore on the Go plans to capture and provide information in edible chunks to make sure users who like reading more information regarding a place etc. can do so. We also plan to leverage crowd sourcing for reviews and ratings like Yelp for recommending popular / trending restaurants & bars to users. A few of the most popular online websites and travel forums that travelers use to explore about Chicago and other places are: Lonely Planet, Tripadvisor.com, Yelp for restaurants, and blog posts by famous travelers. Access to a different options / details, can be fun for people who enjoy knowing history, facts and figures etc. Yelp provides a great source of reviews for restaurants & bars and overall rating as well. It’s just “too much information” and difficult to choose what you want to explore. Below is a list of popular tours in Chicago. Travelers who opt for this would have limited use of Xplore on the Go. Has a guide who has planned out and itinerary and share information at different stops. Guided tours are already planned out covering specific spots / places to visit. Guided tours are great for people who are looking at exploring a city but not interested in research and planning. Inflexibility to customize. Travelers might want to spend half day in guided tour and then by themselves or not follow the whole itinerary. Guided tours have specific start times & might sometimes get booked out. Women travel slightly more often than men. Women report being slightly more active and spontaneous than men. Men report a slightly higher budget for travel. • In the 40 to 68 age group, travelers still use more traditional research tools like magazines and brochures. This group is also not very familiar with new age apps for planning, transportation etc. Most of the people surveyed are familiar with smart phone apps and are heavy users of apps but not necessarily for travel & sight-seeing. Many of them depend on online reviews and ratings for choosing a restaurant etc. As a part of the product development process, we documented some specific barriers, which we took into consideration from the beginning and made plans to mitigate. ​Based on our research of the personas, we suspected that some personas (e.g., spontaneous and restricted time) might not use the app beyond getting to one or two locations. For example, a spontaneous traveler might use the app to go from a park to a museum but beyond that just wander off and start exploring on their own. Based on the profile settings, Xplore on the Go includes suggested itineraries .However, some travelers will want more flexibility within a recommended itinerary. Although the app is customizable, being able to customize to every individual need will be difficult. Although we narrowed our target audience to a certain age group — fairly tech savvy and definitely smartphone users — some travelers prefer using traditional travel-planning resources. For example, Lonely Planet users are very loyal and are huge consumers of recommendations that come through the Lonely Planet guide (guidebooks or online). ​Most travelers have a sense of the main “things to be ticked” while visiting a place. 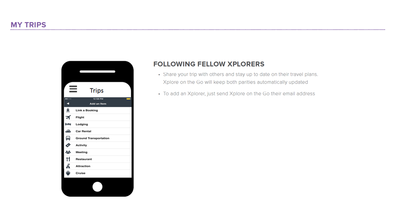 Some users might find it difficult to skip options built into Xplore on the Go’s recommended itineraries. 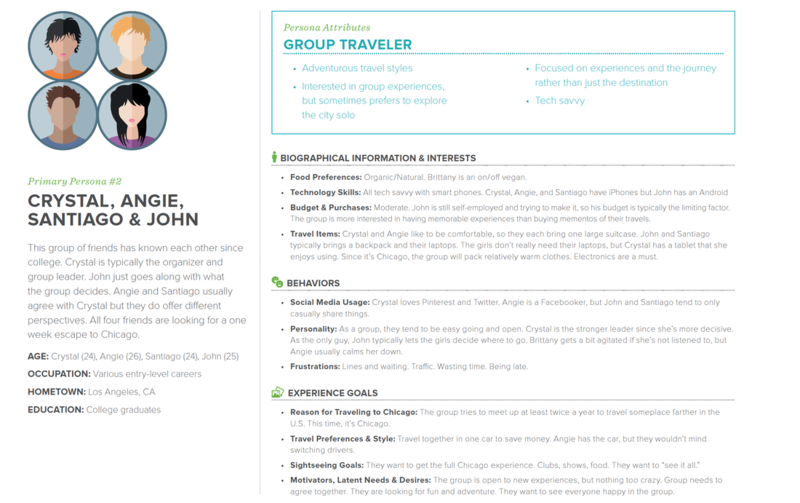 ​Within “group” personas, possible preferences of individuals within the group need to be considered. If the group does not have consensus and has varied interests, it will be difficult for them to navigate through the app. Ensuring that Xplore on the Go provides real-time suggestions and recommendations. For example, if the user wants to spontaneously attend a specific event, the app provides information about buying tickets at the entrance. Real-time suggestions are something brochures can’t do. Creating an alert for having user to follow a specific itinerary as well as alerts about good restaurants in their current area. Providing groups with a way to visit all the sites they want to see in the most efficient way. Technology Savviness: How comfortable is the user in using available apps and technology while they travel? 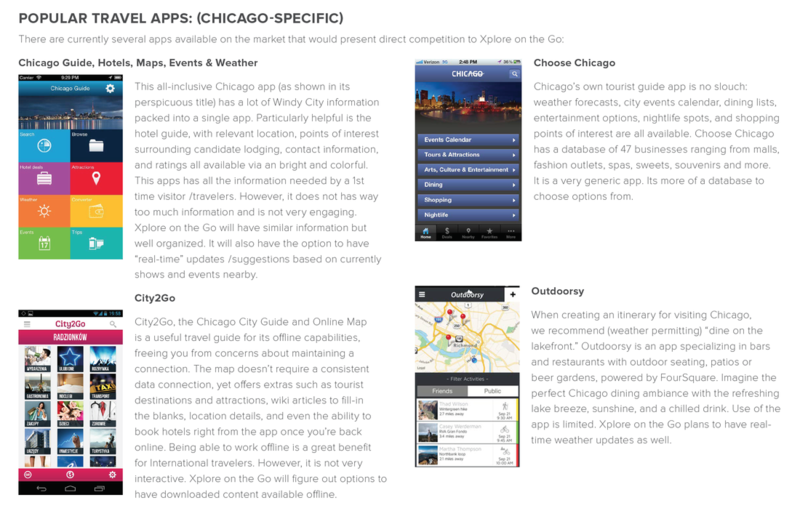 Xplore on the Go as an app that can appeal to all Chicago travelers, so we did not want to necessarily exclude certain audience groups. 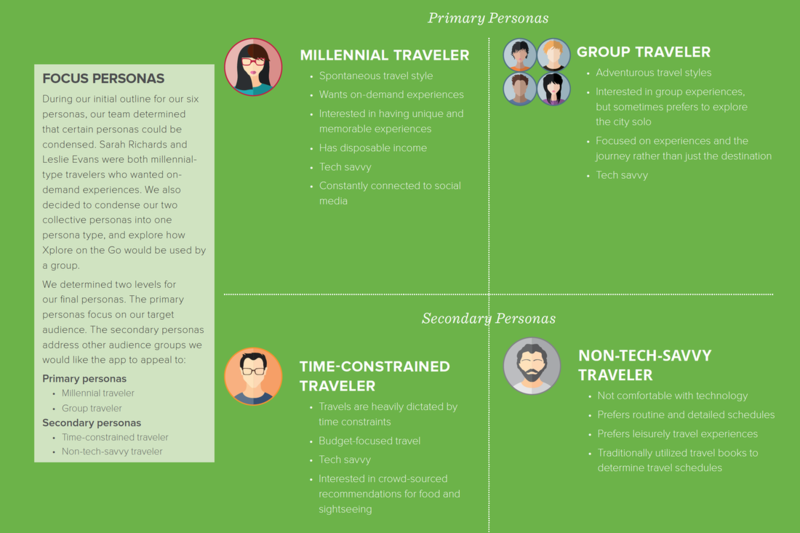 With this in mind, we developed six main personas for users of Xplore on the Go, broken up into two categories of individual travelers and collective travelers. 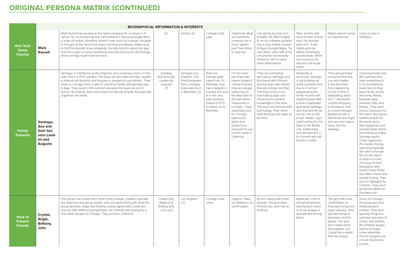 For each persona, we made specific considerations as each user interacts with Xplore on the Go. 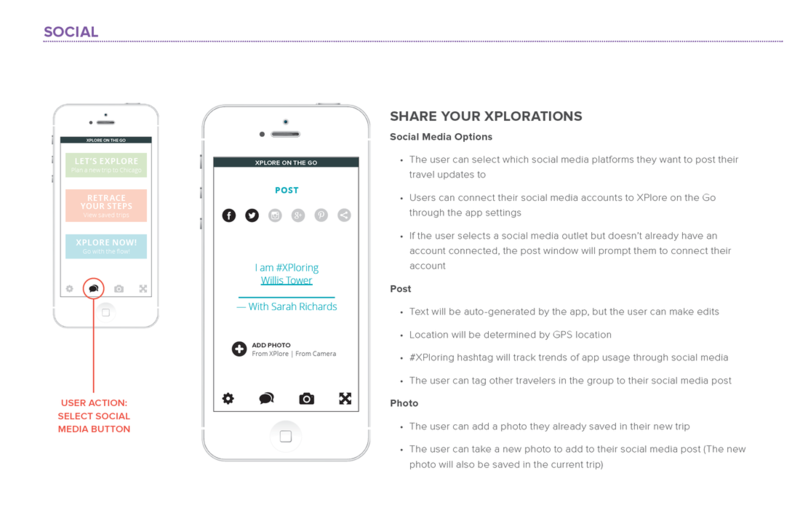 We developed our personas to be as inclusive as possible, to better anticipate how a user in their category would use the Xplore on the Go app. 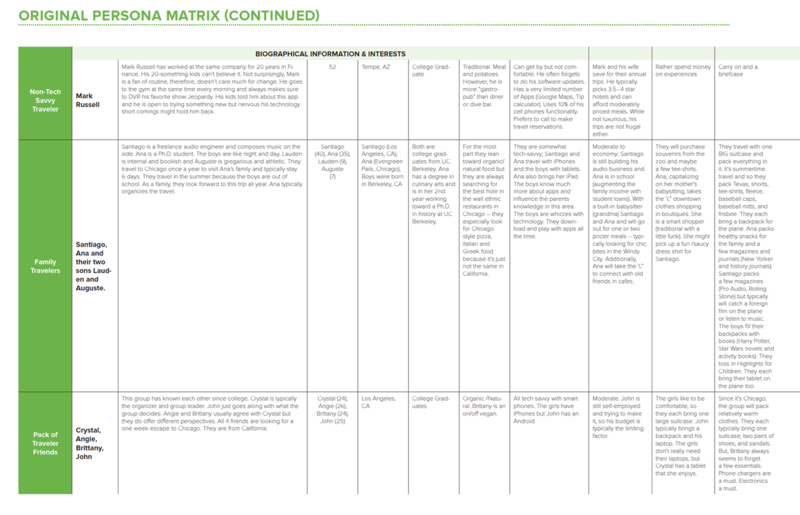 To develop our personas as a team, we developed a matrix that defined biographical information (age, education, hometown, etc. 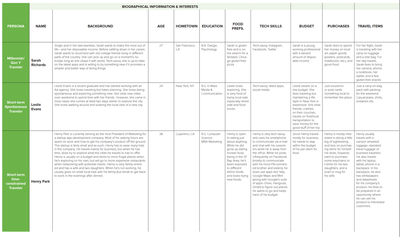 ), interests (food preferences, travel style, tech skills, budget, purchases, etc. 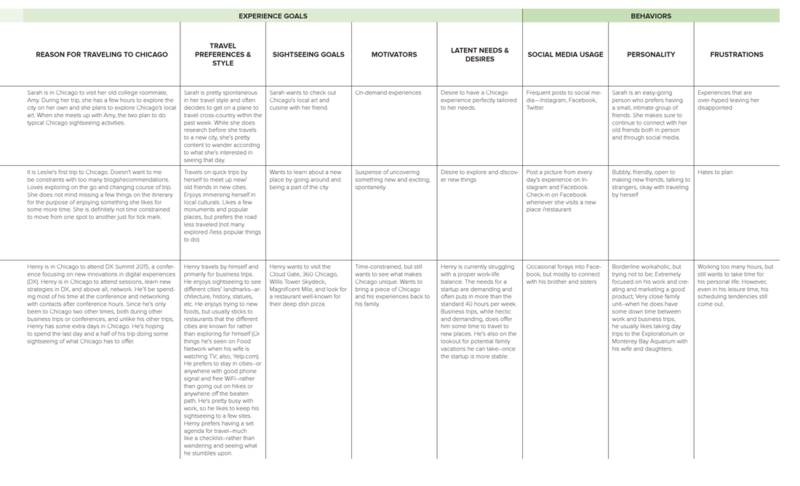 ), experience goals (motivators and needs), and behaviors (personality, social media usage frequency, frustrations with travel). ​As a millennial, Sarah Richards would be interested in on-demand experiences and spontaneous travel. She would want instantaneous access to information on a variety of topics (e.g. food, points of interest, travel, etc.). 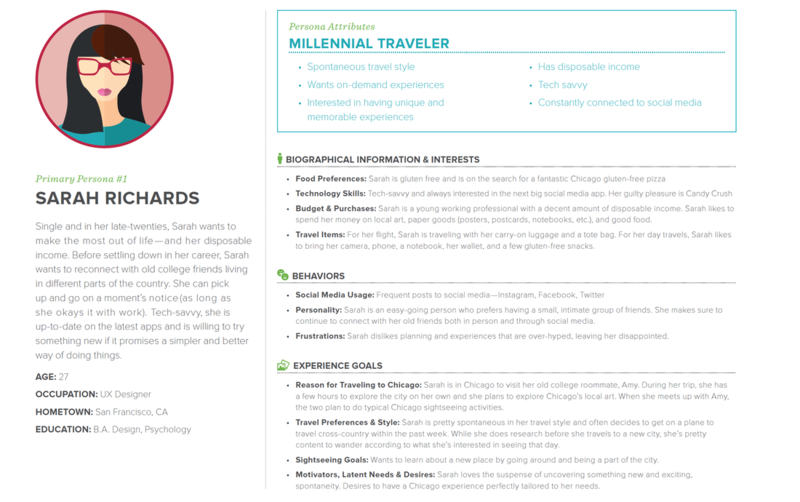 Through Sarah Richard’s “Millennial Traveler” persona and customer journey, we will explore how she would interact with Xplore on the Go’s large database of tourist information. She is traveling by herself and is in Chicago to visit her friend. She arrives in Chicago around noon and is planning to meet with her friend in the evening. During the few hours to herself, she will be looking to use Xplore on the Go to find some quick sightseeing in her immediate vicinity. Leslie Evans is interested in spontaneous travel. She does not like to plan her trips and finds existing travel resources and review sites to be too constraining in her travel style. She likes to explore wherever her feet decide to take her, so Xplore on the Go needs to keep up. Through Leslie Evans’ “Short-term Spontaneous Traveler” persona, we will explore how she would interact with Xplore on the Go’s augmented reality features. Leslie will travel wherever her feet take her but at the same time she doesn’t want to miss any of Chicago’s hidden secrets. She loves walking around and soaking the local vibe of a new city and Xplore on the Go’s augmented reality features will help her “plan” her day without the actual hassle of planning. Santiago, Ana, Lauden, and Auguste create a collective persona that has clear leaders (parents) and followers (children). 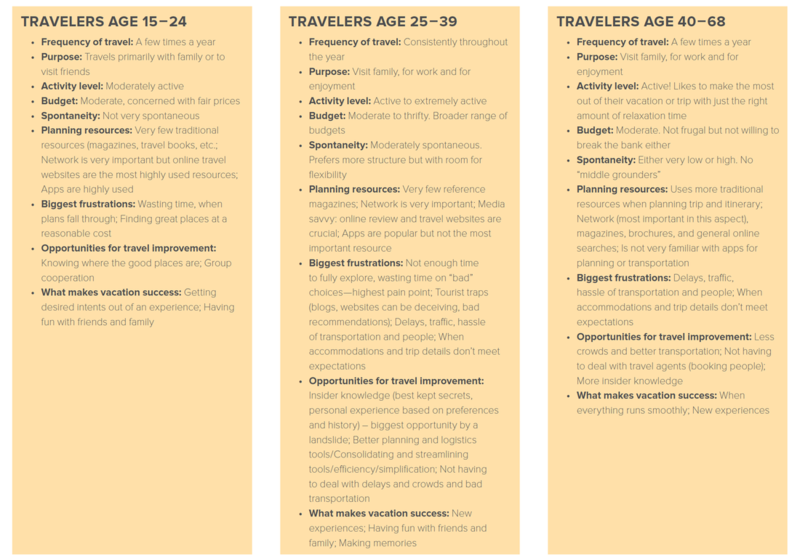 Their travel plans, however, are designed through group input—as a family—and are meant to include interests from all members. Through this family persona, we will explore Xplore on the Go’s ability to customize travel experiences through multiple input features. 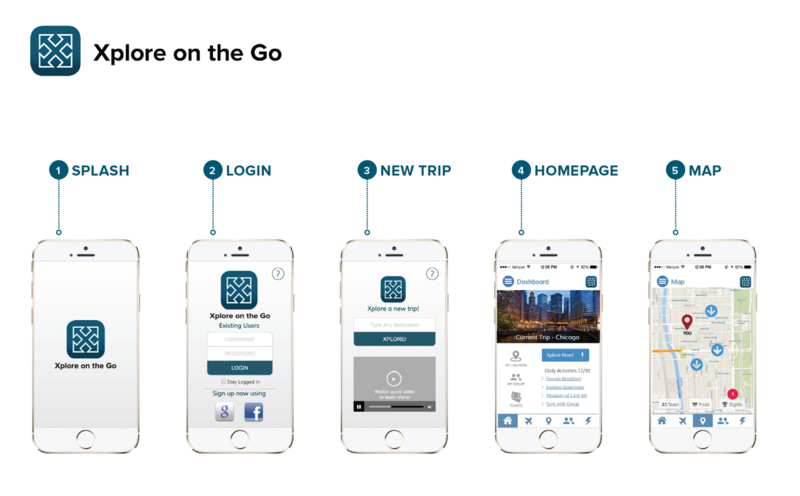 Through Santiago, Ana, Lauden, and Auguste’s “Family Traveler” persona, we will explore Xplore on the Go’s ability to customize travel experiences through multiple input features. This collective persona will travel together but have a variety of different activities to incorporate the interests of the group. Young, spontaneous, tech savvy, constantly connected to social media, and the quintessential embodiment of YOLO. Crystal, Angie, Brittany, and John are a close-knit group of friends that while traveling as a group unit, maintains their own individuality. With different preferences and free-form travel style, somehow, this group makes it work. Additionally, with their different interests, this group may choose to split ways during the day and meet up later at a club or restaurant. 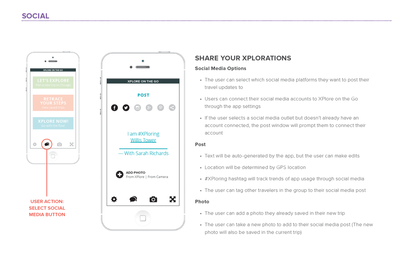 Xplore on the Go seeks to provide this collective persona with ways to integrate their travel styles with social media and provide the group with GPS tools to determine a central location where the group can meet when they choose to go their separate ways. Now, we've determined the problem we wanted to solve. Our next step was to develop a solution. We moved away from observation and ideation phases and into the prototype phase. 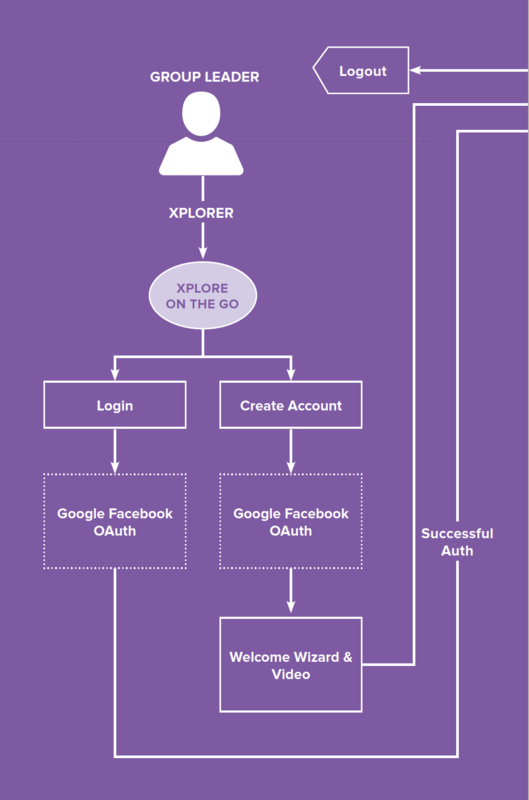 To begin this process, we developed a user flow mapping how a user would interact with Xplore on the Go. 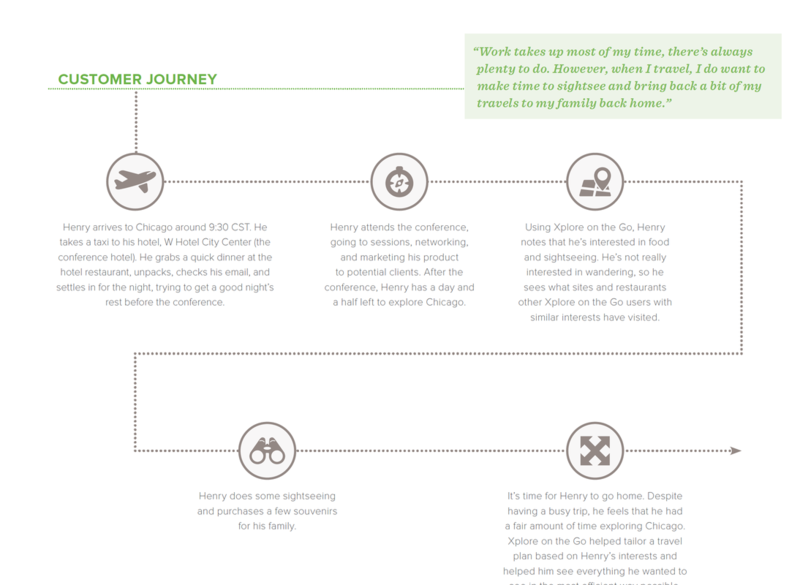 We used this user flow to develop wireframes and ultimately, the final design of our app. Time to explore our users interactive experience. 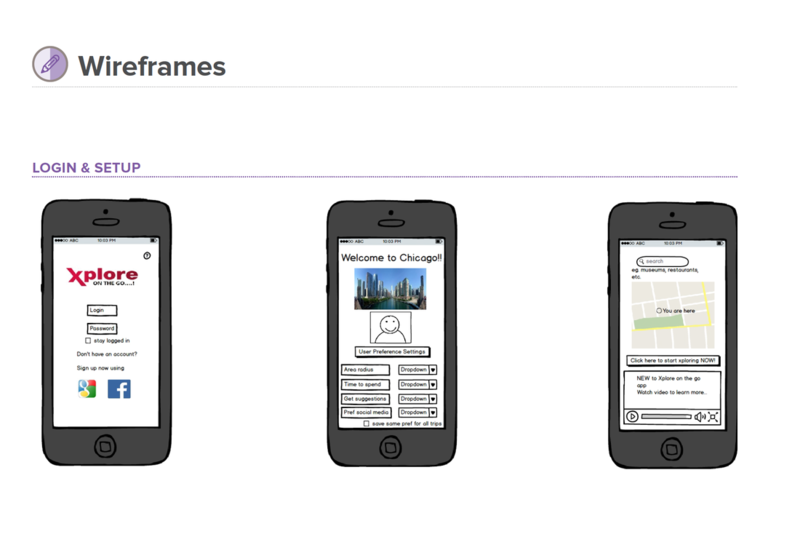 We went through many wireframing sessions, exploring different routes, testing it with users, and seeing which interactive flow delivered the most value to our users. 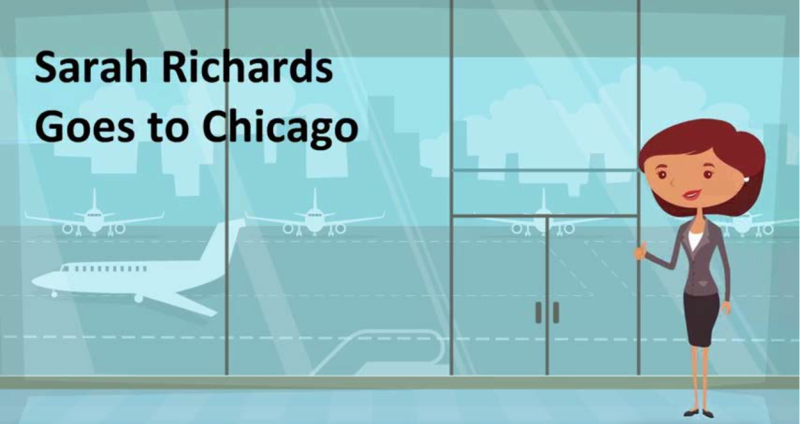 “Sarah Goes to Chicago” is an animated video that highlights how Xplore on the Go improves Sarah’s travel journey. 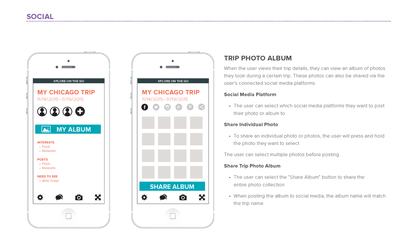 The video provides scenarios where the app solves travel problems Sarah faces, like sharing group travel itineraries and planning activities in real-time. 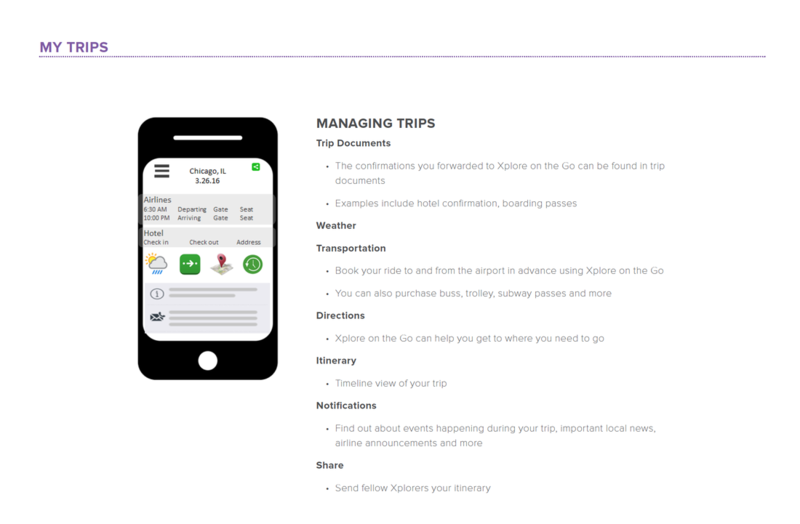 Our team created the animation to visually portray a use case or how someone might use Xplore on the Go to address a travel pain point. The animated video takes out the technical speak, and in a simple way, highlights how a potential “Xplorer” can eliminate travel frustrations, like meeting up with a group and agreeing on an itinerary. Instead of relying on feature and functionality descriptions to sell the app, creating scenarios like the animation video helps future Xplorers see themselves using the app to overcome an obstacle and achieve a specific goal. 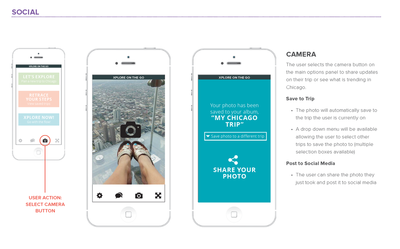 The video helps us “show” instead of “tell” the benefits while humanizing the app. 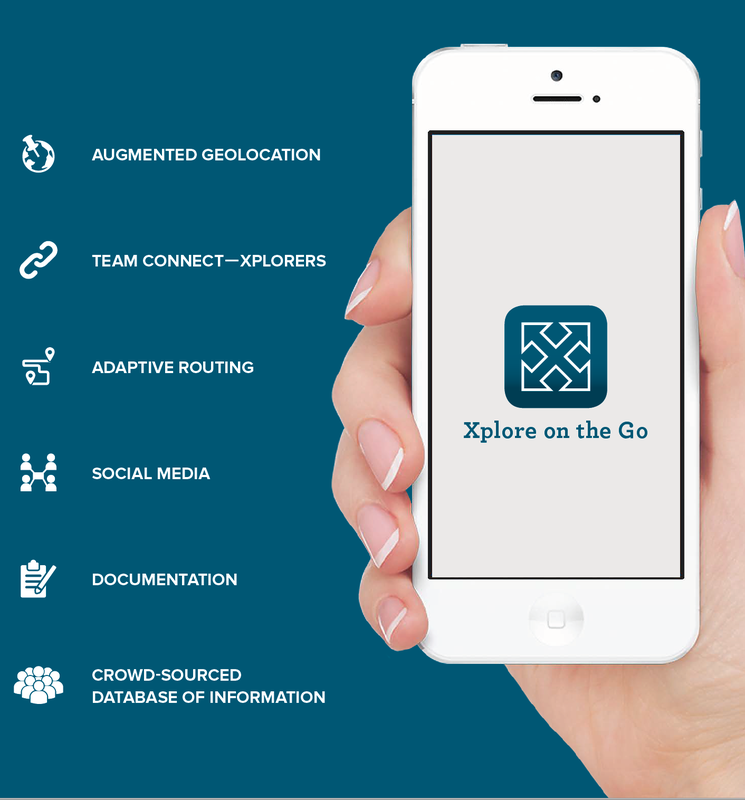 Augmented Geolocation: Xplore on the Go harnesses the user’s location, preferences, and friends’ locations to construct spontaneous itinerary for exploration. 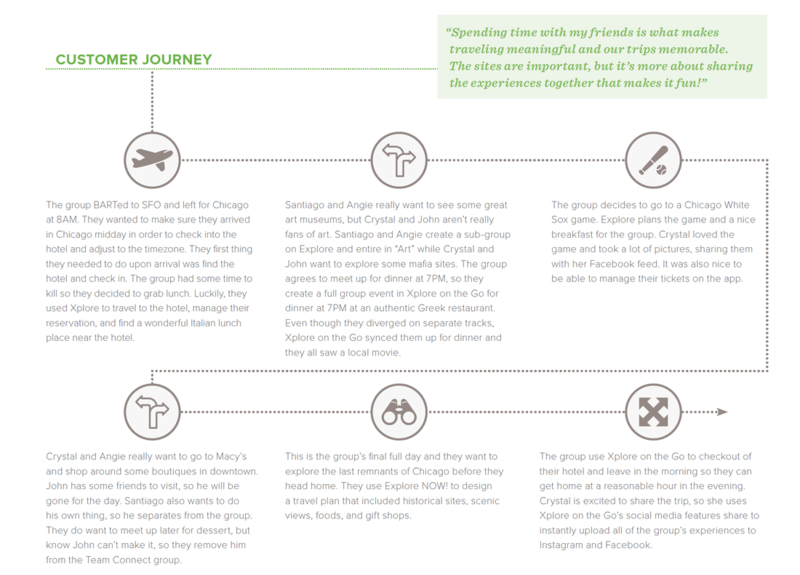 Team Connect — Xplorers: Xplore on the Go powers groups to spontaneously visit and explore areas with minimal planning. This releases teams from groupthink and any decision-making friction. Adaptive Routing: Xplore on the Go understands that plans change, so it will adapt your daily itinerary based on your location, interests, and time of day. 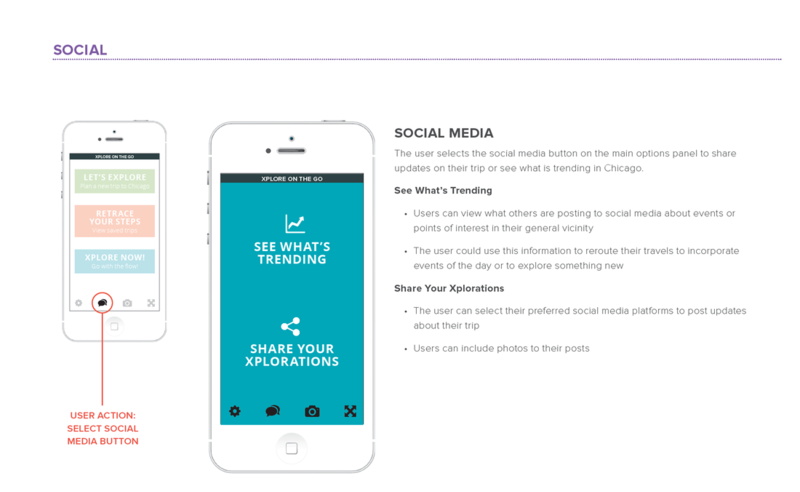 Social Media: Xplore on the Go helps the user share their travel experiences by seamlessly integrating social media into the app. 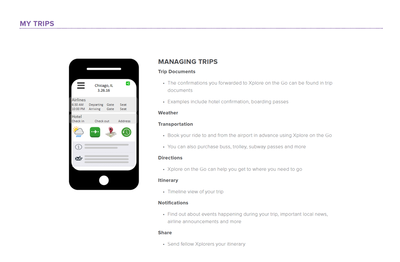 Documentation: Xplore on the Go helps the user document their travels through photos, favorite locations, and saved routes. 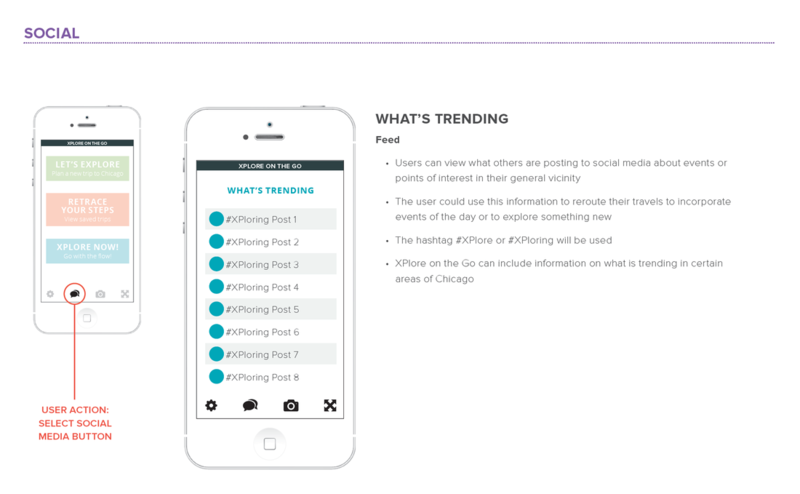 Crowd-sourced database of information: Users can draw from a large collection of interesting locations in Chicago’s with Xplore on the Go’s large database of crowd-sourced information. 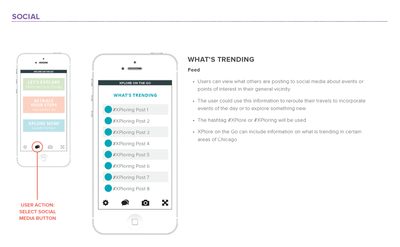 Users can see what other users have found interesting and follow in their steps. Market research was an important first step in developing our app. 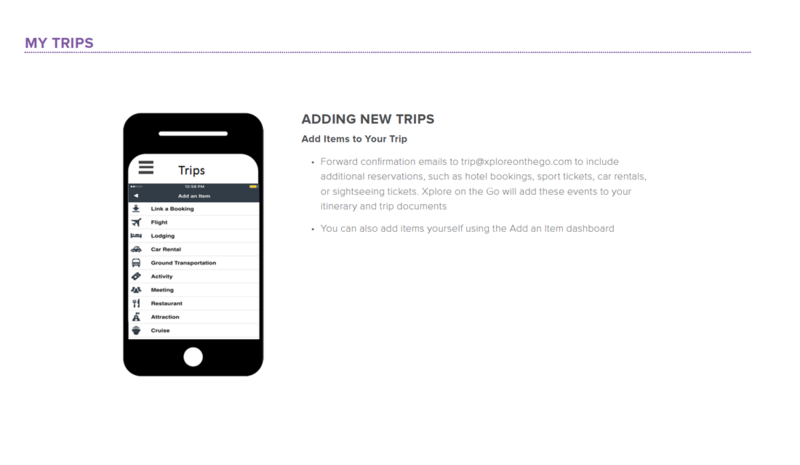 We determined the pros and cons of each of the multitude of travel resources available, and aimed to design an app that offered something better. Engaging users for the long term was an important part of our design strategy, since we wanted to ensure that users would continue to use the app and not revert to their previously used resources. Choosing the most effective research methods helped refine our focus on a target audience. 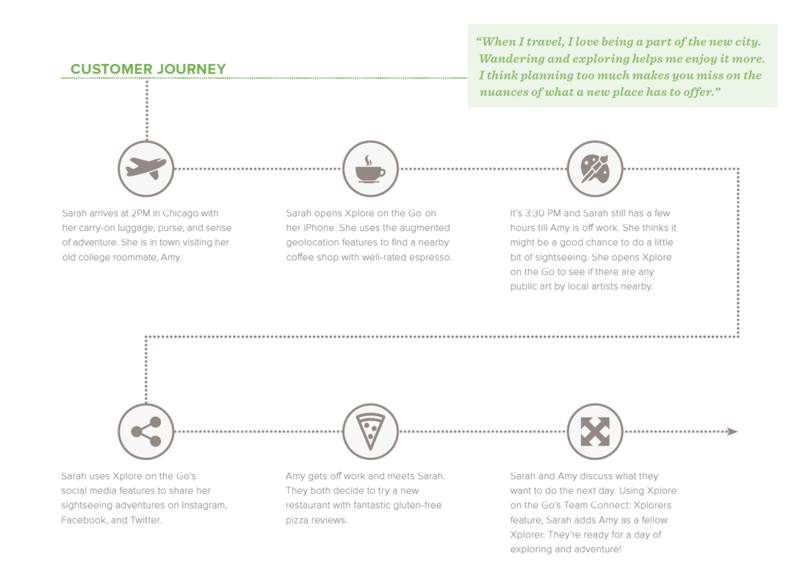 Slicing and dicing the data helped us build out a good story for our customer journey. Creating a prototype was challenging since we were required to decide how much functionality or how many views a user needed to see in order to comprehensively test the app’s usability. 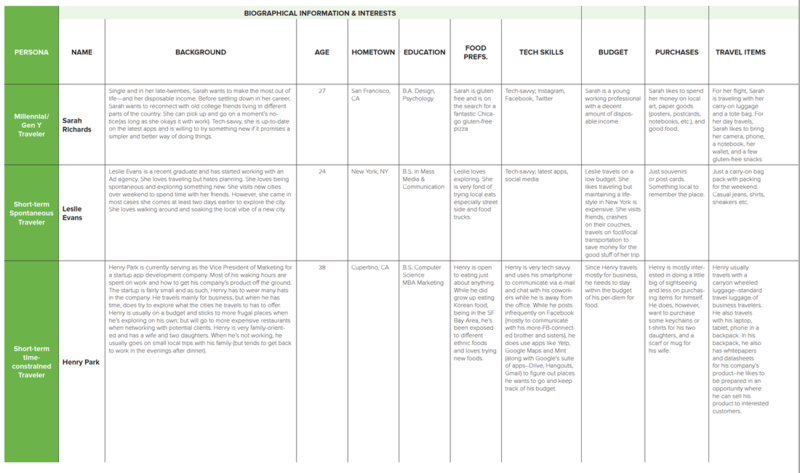 Defining personas was a key building block for creating a user-centered app. 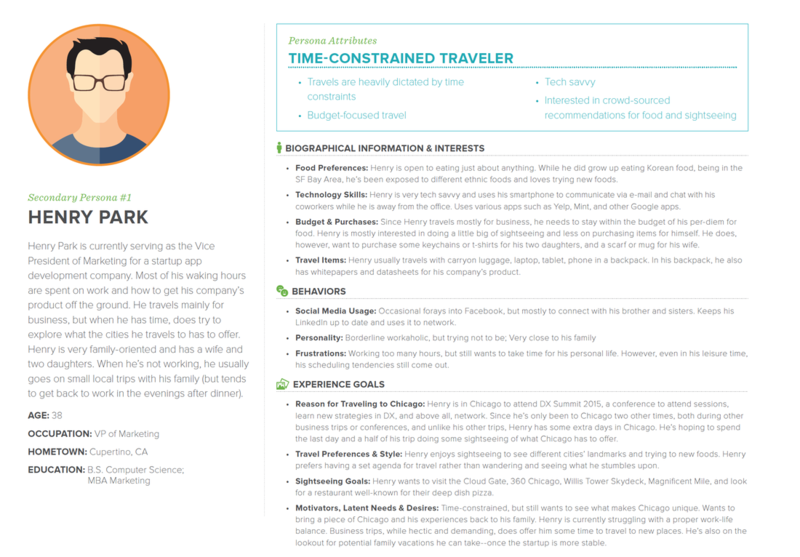 Once the personas were defined, we were able to focus on the app’s functionality from the user perspective. 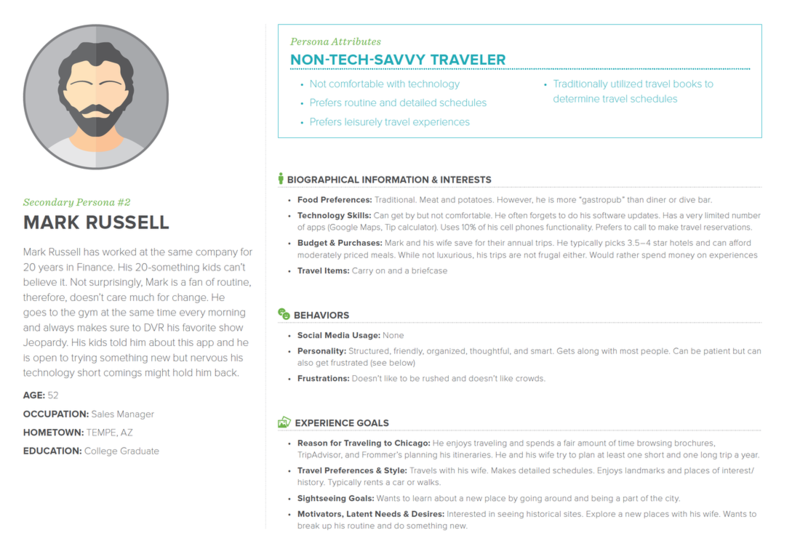 Moreover, being able to personally relate to a persona was helpful in determining how they would use Xplore on the Go. 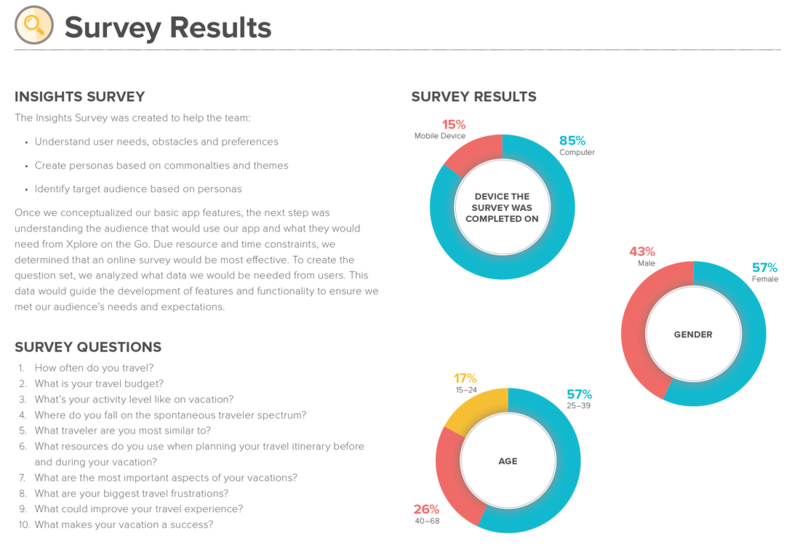 User surveys provided helpful insights, but we learned that an on-the-go app would ideally undergo real-world tests to see how people interact with their devices while on vacation. Project collaboration is as important as project management. Consistent and transparent communication, encouragement of multiple perspectives, and clear expectations and accountability were the cornerstones of our success. Our team was diverse, with varying working styles, but there was a tremendous amount of flexibility, respect, and humor.